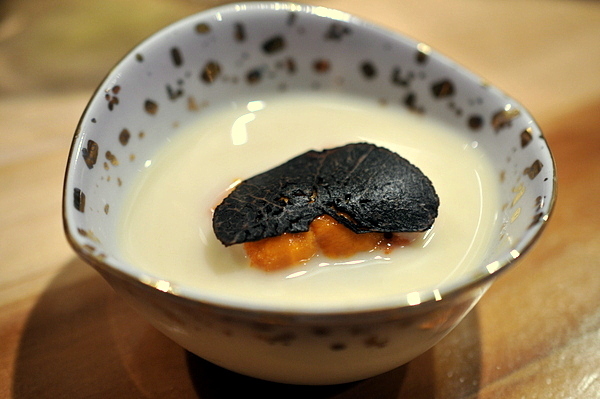 Yamakase could very well be the best restaurant you've never heard of. 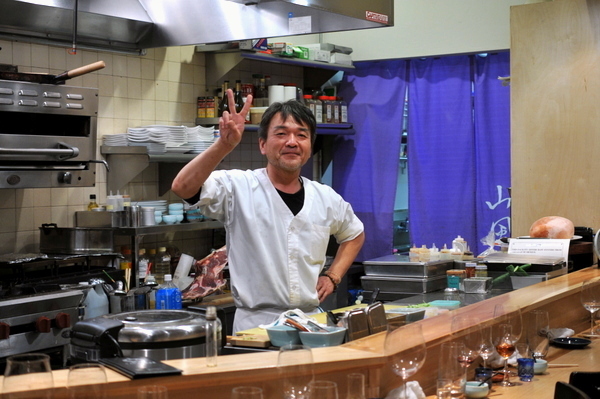 The restaurant is run by Kiyoshiro Yamamoto who built quite a following at The Hump before it was shuttered. 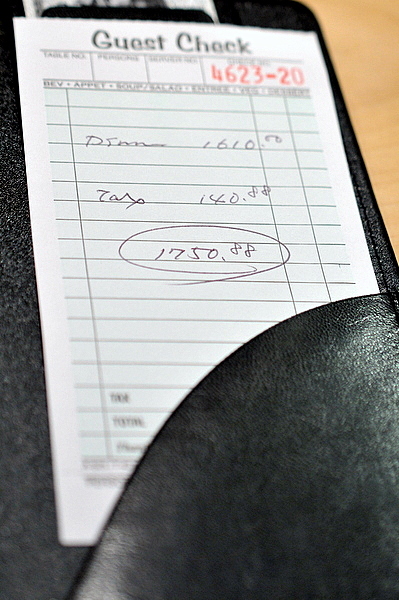 Yamamoto's backer is one Stan Liu, a former Disney exec, who finances this restaurant solely to give Yama-san a forum to share his unique brand of Western-influenced Japanese cuisine. The invite-only restaurant still remains something of an open secret known mainly to the city's sushi cognoscenti. I finally had an opportunity to try the restaurant and my party decided to take full advantage of the BYOB policy with a mix of vintage champagne and old Burgundies and Bordeaux wines supplemented with sake from the restaurant's list. Our first bottle, the 2002 Tattinger had a sublime balance with notes of toast and hazelnut followed by elegant fruit laced with minerality. A bright citrus on the palate is balanced by an effervescent acidity. I've had this classic Spanish duo at both é and Saam but I never expected to find it at a Japanese restaurant. The ham lacked the overt oiliness of an Ibérico de Bellota but the firm dry meat still packed plenty of rich porcine savor. 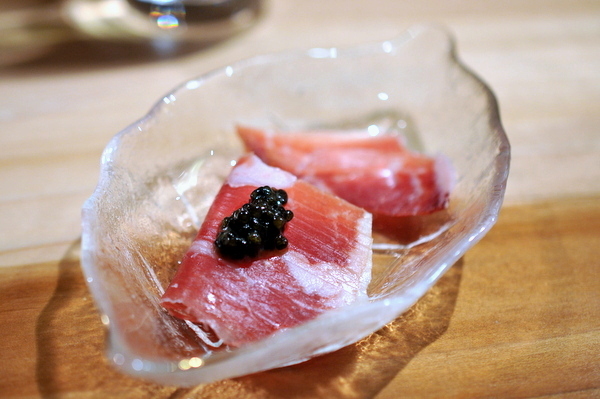 The caviar augments the ham's salinity while bringing a touch of nutty funk to the mix. Our second course featured jellyfish doused in a boldly tart sauce. The One of my companions humorously noted the one-two punch of ham and jellyfish reminded him of the appetizer plate at Chinese banquets. 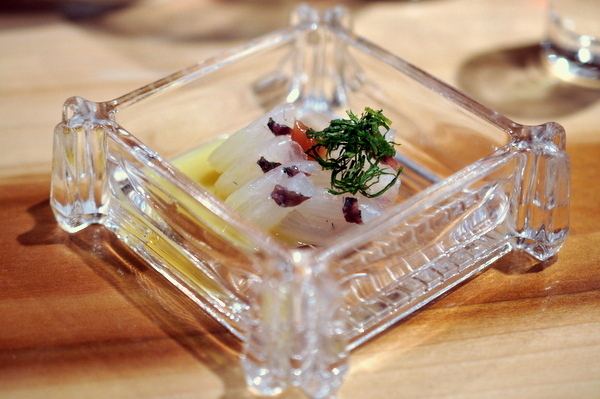 Two pristine slabs of Japanese Butterfish came in a rich creamy sauce and topped with finely diced apple. For something something named Butterfish, the sashimi was surprisingly mild though feeling the soft even flesh part like soft velvet was a tactile joy. The topping of apple and creamy sauce was a bit too sweet for my tastes. 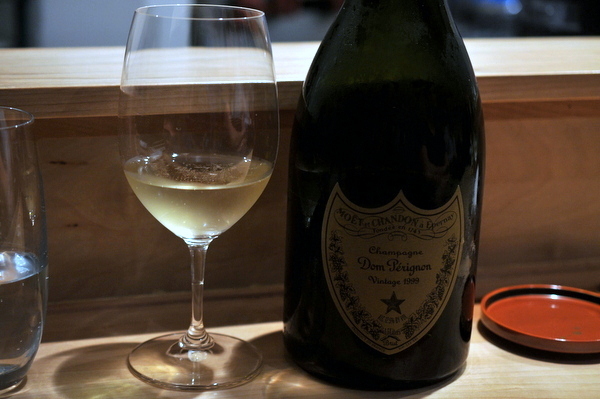 The Dom showed quite a bit more age than the Tattinger with plenty of citrus, yeasty toast, and graphite all shaded with a light oxidation. I initially mistook this for a chawanmushi but the base turned out to be a rather restrained corn soup. The thick velvety potage coated a veritable bounty of seafood but the mild flavor let the freshness of the shellfish shine. These were among the two most flavorful bites that I've had all year. 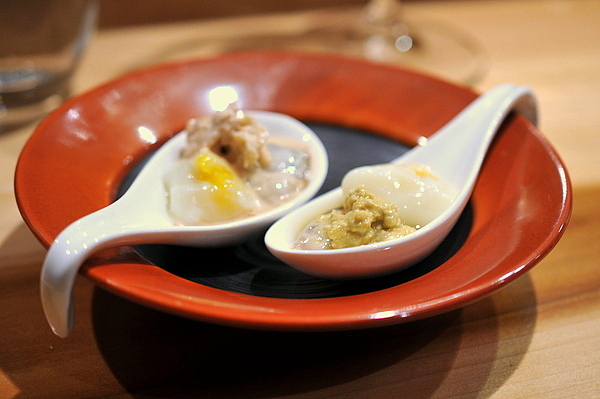 Personally I preferred the spoon with the crab guts, the offal-y richness of the guts stands out despite being tempered by the fresh yuzu juice and creamy body of the egg. The clean flavor of the Kusshi shows up on the finish and takes on an even greater sweetness thanks to the innards. 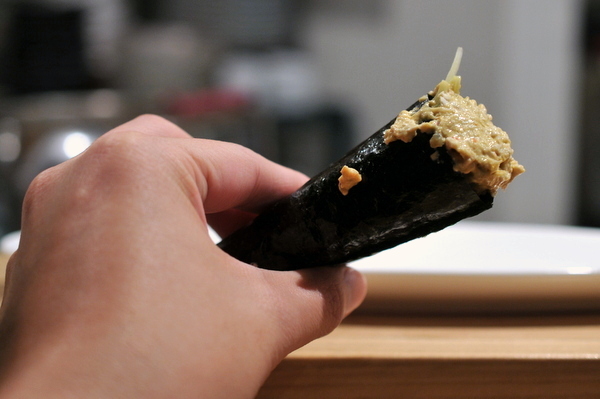 The second bite is much simpler playing off the duality of sweetness from the crab and sesame which conversely highlighted the salinity of the Kusshi. 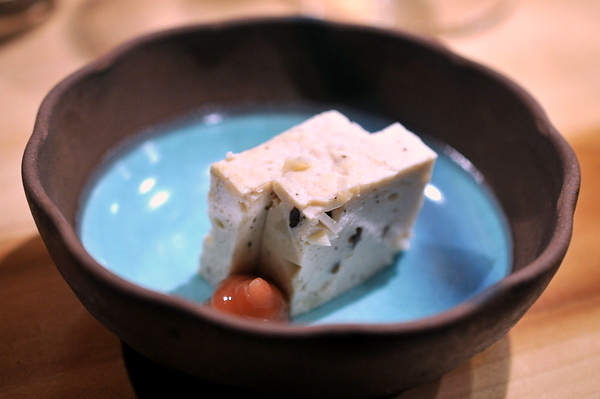 Yama-san explained that he hates traditional tofu so he made this as his substitute. Texturally the "tofu" has a dry mealy meatiness more reminiscent of chicken nuggets than tofu. The combination of chicken, potato, and mushroom gives the cuboids a remarkably hearty flavor perfectly set off by the funky tang of the plum sauce. Calling this a salad diminishes the sheer amount of effort that Yama-san put into making this dish. The intense colors translate to equally vivid flavor and textures on the palate. 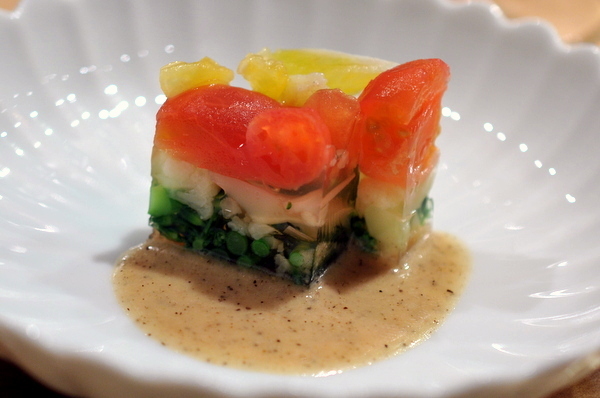 The tang of the baby tomatoes contrast beautifully with the bitter crunch of the asparagus while the mentaiko provides an overarching salinity layered with the spicy bite of the black pepper dressing. 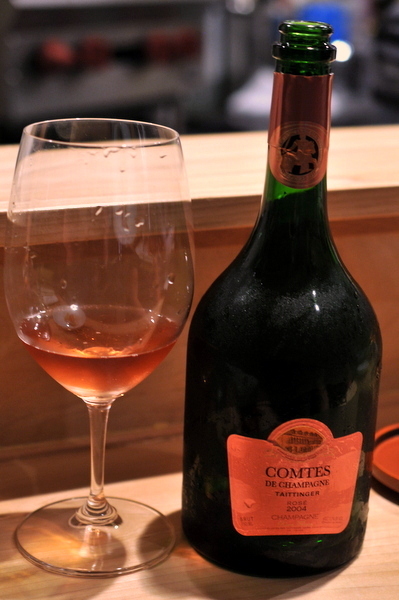 A much more intense champagne than its 2002 sibling, the Rosé explodes with tart strawberries and other juicy red fruits. 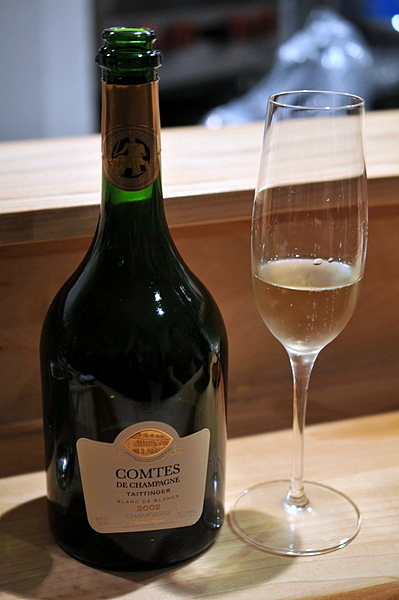 A little time and aeration mutes the intense fruits enough for flavors of smoke and mineral to show on the palate. 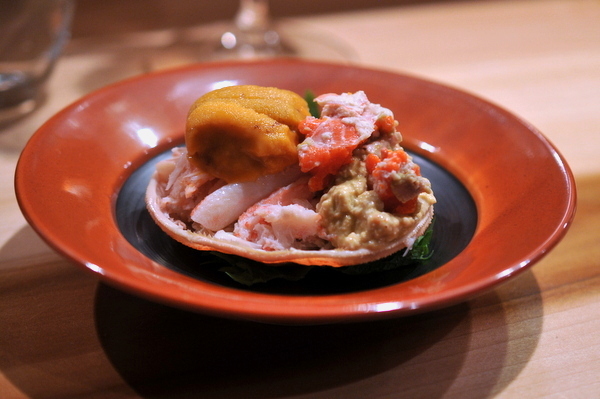 Served in a baby snow crab shell, this dish was a focused study on the varied nuances of the prized crustacean. 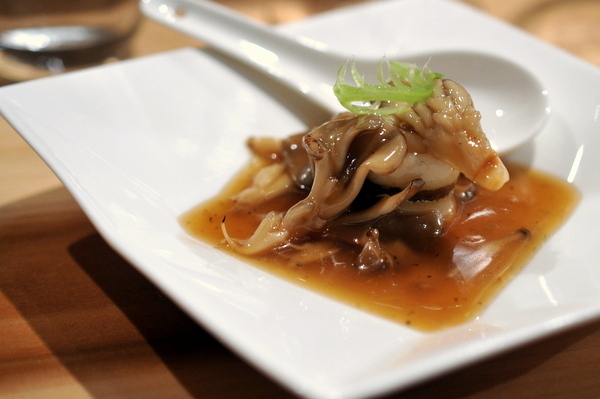 The combination of leg meat, innards, and coral showed a dynamic interplay of flavor from sweetness to pungent brine. The uni acted as a sort of adhesive grounding the ever changing mix of sweet and savor. This dish was a veritable treasure chest of seafood goodness. No one element stood out but the melange of seafood provided a multifaceted salinity tinged with the luxurious richness of truffle butter and the hearty warmth of the silky egg custard. After finishing the custard I greedily slurped the remnants of butter and seafood broth at the bottom of the bowl. 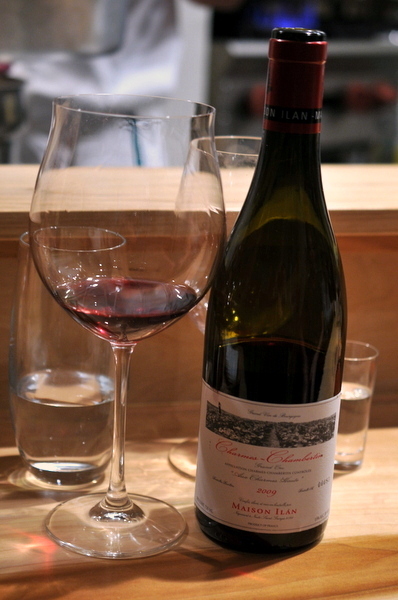 The nose of this wine reminded me why I fell in love with Pinot, a veritable cornucopia of sour cherries and tart berries balanced with a woody spice and notes of earthy loam. The wine was a bit one-dimensional on the palate showing lots of acid and some faded red fruit. Fortunately the next course featured an abundance of acidity that balanced the wine revealing some of the gamier elements on the palate. 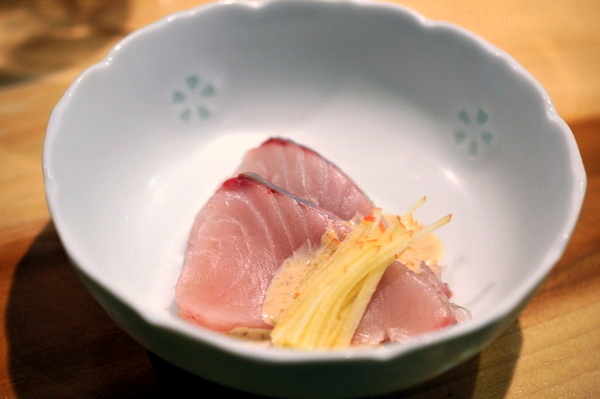 This was a real treat, Yama-san sliced the fresh halibut into paper thin sashimi most of which was topped with lemon juice and a fine dust of Himalayan salt. The freshly killed halibut still retained a light muscular chew while the astringency of the lemon juice dominated on the palate. The remaining piece featured a dollop of piquant plum sauce while the engawa's oily heft was augmented with a dollop of caviar. 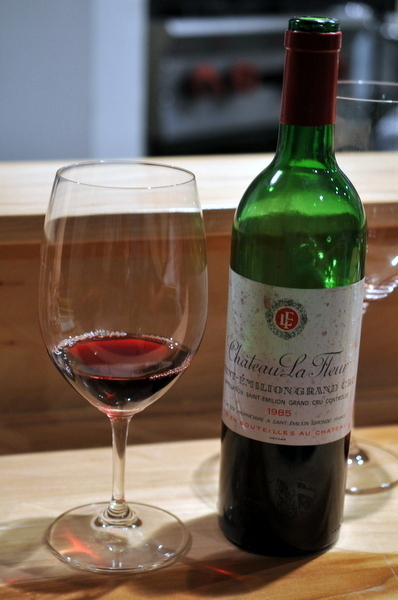 A decidedly fruit forward Bordeaux, the wine could have passed for one half its age with pointed flavors of sumptuous dark fruit that hint at its Right Bank origins. 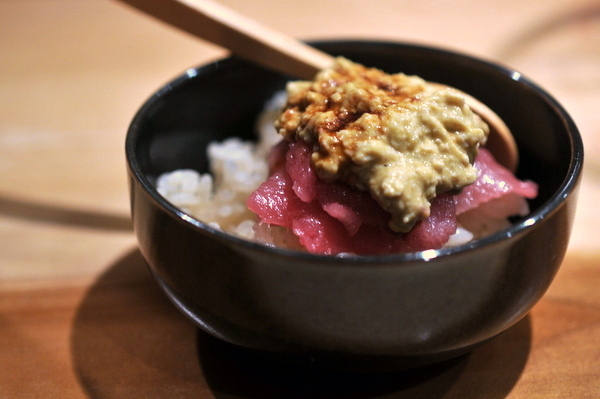 Next up was a small dish of meltingly tender tuna doused with wasabi and house made soy sauce; a testament to the attention to detail Yama-san brings to his food. 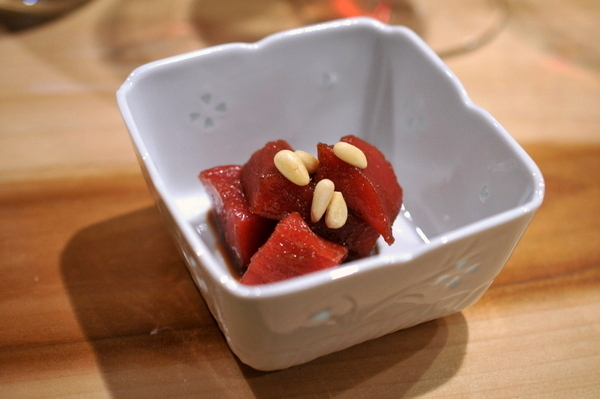 The pine nuts add a toasty twist to what would have otherwise been a very good if conventional marinated tuna. 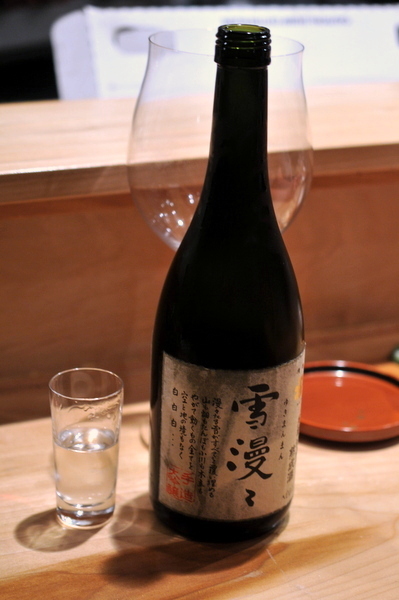 According to Stan and Yama-san the sake is aged for five years at 23 degrees. The result is a deep citrus, tropical fruit, and flowers that is surprisingly fresh and light on the palate despite a fairly viscous mouthfeel. Though Sayuri is no longer the rarity it once was, I don't think I've had it prepared any way other than sashimi or nigiri with traditional accompaniments. The miso vinaigrette was a bold choice, bringing a floral sweetness to the fray though personally I would have preferred a more acid driven approach. This was Ludo's contribution to our meal a young Burgundy from the young hotshot winemaker Ray Walker who gave up his career in finance and moved to Burgundy to follow his passion for wine. 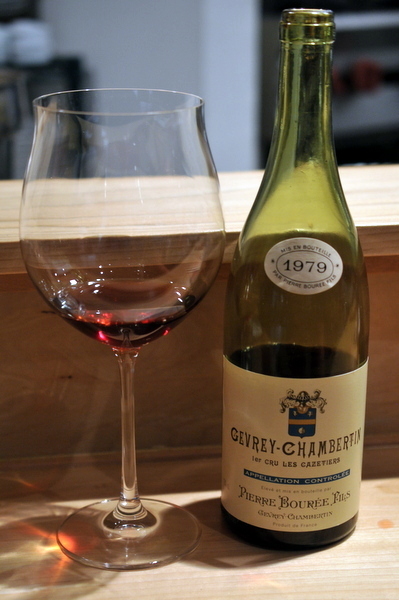 The 2009 Charmes-Chambertin is a prodigious wine with intense round fruit and cola notes with minimal game or earth; yet despite the intense ripeness the wine still demonstrates balance and restraint. I absolutely adored the earthy bouquet and springy texture of the fresh mushrooms. A thick sauce gives the mushrooms both heat and and acidic funk that one of my companions likened to hot and sour soup. A thick coil of needlefish hidden beneath the fungi gives the dish a nice dense textural contrast. In a show of playful whimsy, Yama-san decided to offer us "breakfast" in the middle of dinner. 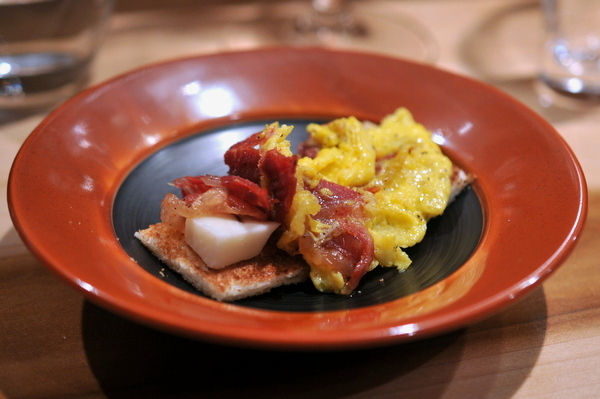 A delightfully gentrified play on a humble favorite the dish unfolds as one might expect. The cheese melts leaving behind a sharp foil for the fatty ham while the egg and toast give the dish a hearty grounding warmth. 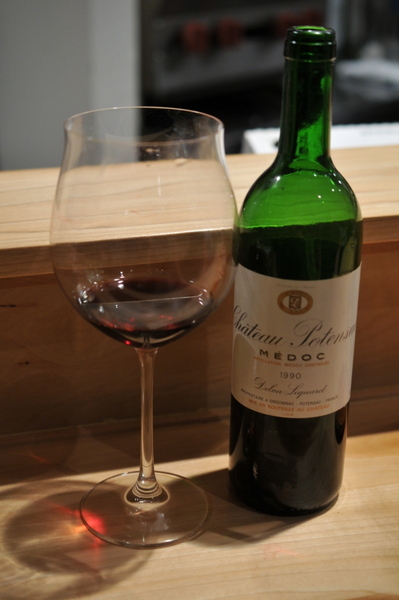 The 1990 Potensac was structured more like a classic Bordeaux with aromas of currant and ripe berries matched with dusty tannin and good acidity that paired nicely with the Kagoshima beef. Yama-san prepared his beef the same way I do at home, searing the meat in a hot pan and seasoning with salt and pepper though the splash of rare 21 year old Macallan was an unexpected treat. The result was a perfectly seasoned and cooked piece of meat that deftly showed off the marbling without feeling overly heavy. 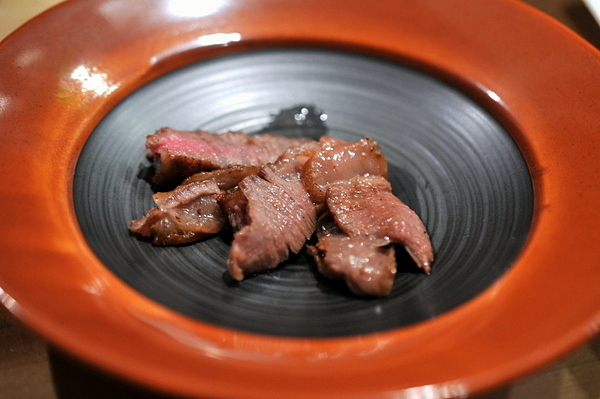 The beef came with a soy-onion dipping sauce and yuzu kocho and though both were delicious neither was truly necessary. 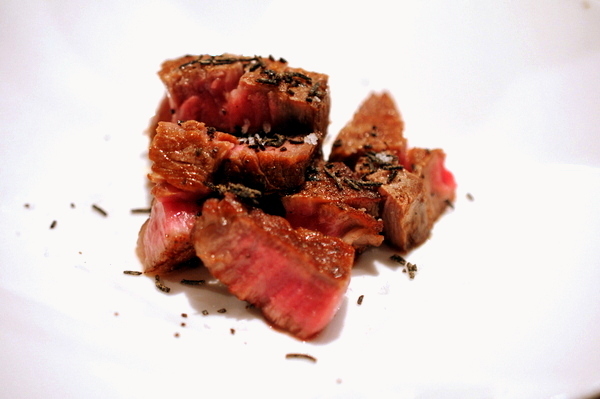 Unlike most Wagyu steaks I could have eaten a full portion of this without being overwhelmed by the fattiness. At our request he even cooked up the fatty trimmings that he typically discards. 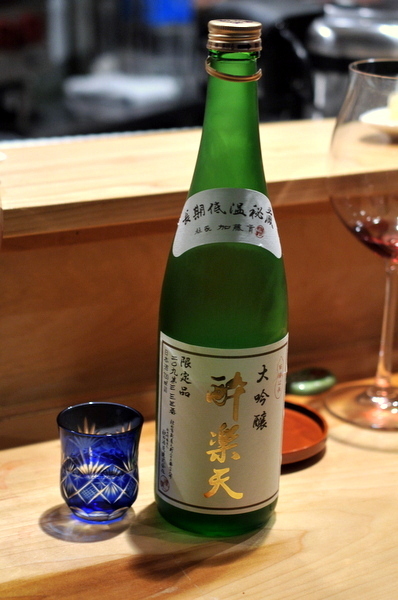 Our second sake also enjoyed an extended aging period which helped give the wine an extra layer of luscious melon atop the pristine feel of a mountain spring. 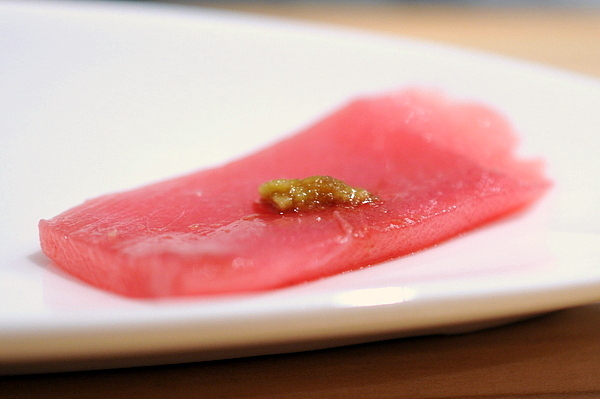 Moving onto sashimi and sushi, Yama-san opened with the big guns: a slab of toro whose dainty pink coloration belied the buttery power lurking beneath. 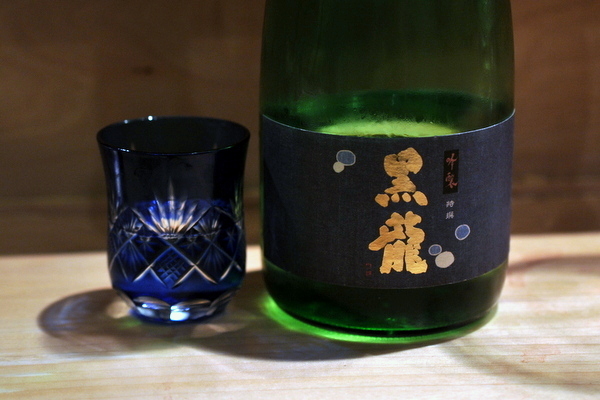 The dollop of yuzu kocho added a lovely contrasting note of sour heat. Yama-san told us this was a special scallop with a large trangular shaped shell which sounds a lot like the Tairagai I had at Maki Zushi. 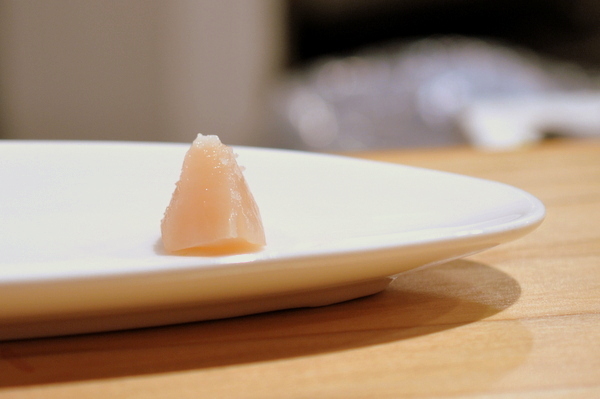 The flesh is substantially firmer almost clam-like compared to the typical scallop while the flavor has more salt and mineral. 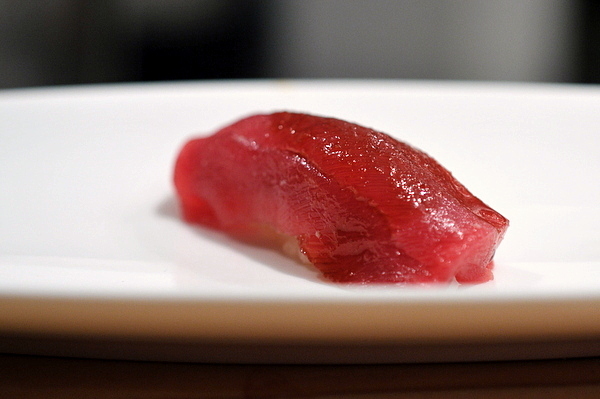 Moving onto sushi we started with an absolutely pristine piece of tuna. Yama-san uses a red wine vinegar in his rice whose fuller vinuous astringency went quite nicely with the clean flavors of the maguro. An absolutely immaculate piece of geoduck, the ivory colored flesh was flush with brine and had an urgent snap to it. 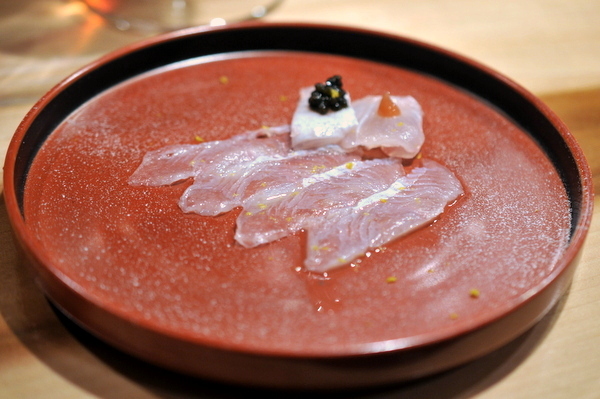 Classic accompaniments of yuzu and shiso add depth and contrast to the clam. 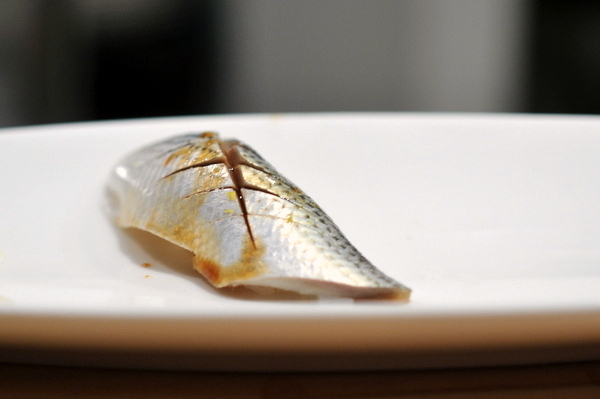 Kohada is often a very forgiving fish thanks to its intense fishiness but Yama-san's still managed to stand out from the pack. A vinegar marinade gives the oils a slightly sharper tang while the dusting of yuzu zest adds a bright levity to the bite. 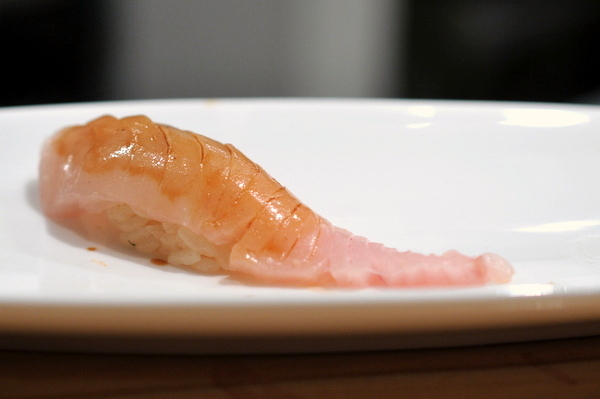 Like the sashimi, the nigiri is saturated with fatty goodness complimented nicely by the soy and wasabi then finished perfectly with the twang of the red vinegar. 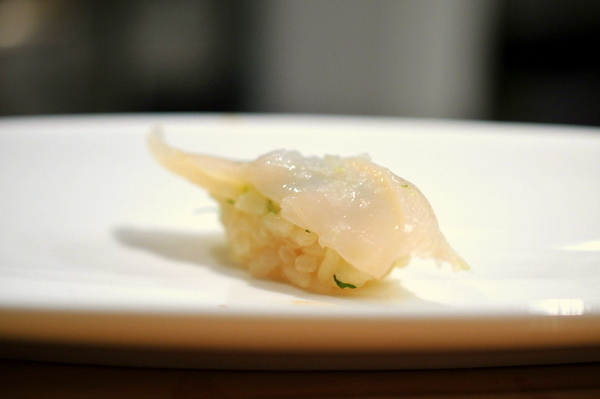 Again I'm puzzled by the butterfish, the texture has a distinct fleshiness to it but the flavor is remarkably light. Stan noticed we finished our sake but with a few dishes still to come he decided to offer us a taste of one of Yama-san's favorites. The Crystal Dragon eschewed the overt fruitiness of the previous sakes in favor of a rice-y booziness. 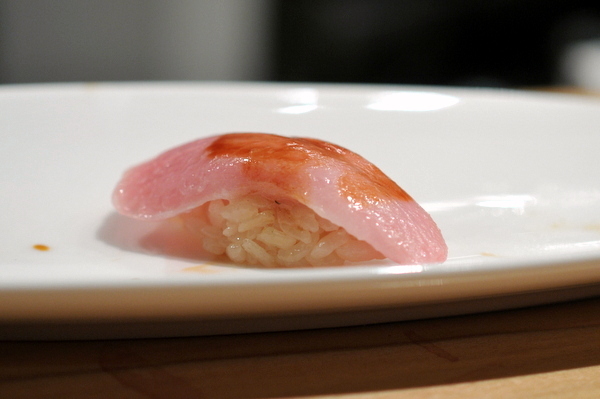 This already stunning roll of toro and sweet blue crab is elevated by a batter of sapid crab guts. The innards give the roll an overarching livery tang though the sweetness of the crab and butteriness of the fish are both still quite apparent. 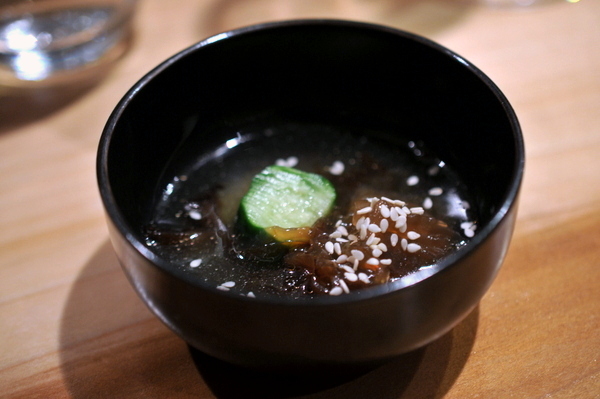 Designed to be a palate cleanser, Yama-san paired the succulent crunch of raw cucumber with a piquant ume paste which made for a refreshing combination indeed. Yama-san noticed that we were still hungry so he whipped up something he called the "hungry boy special." This was similar to the roll we had earlier, pairing a mix of creamy crab innards with lean tuna on a bed of tangy warm rice. 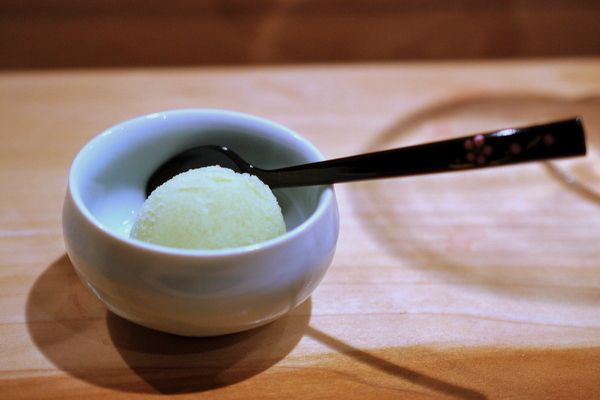 Forget the traditional green tea ice cream, Yama-san serves up a tantalizingly fresh dessert made with green Japanese peaches. 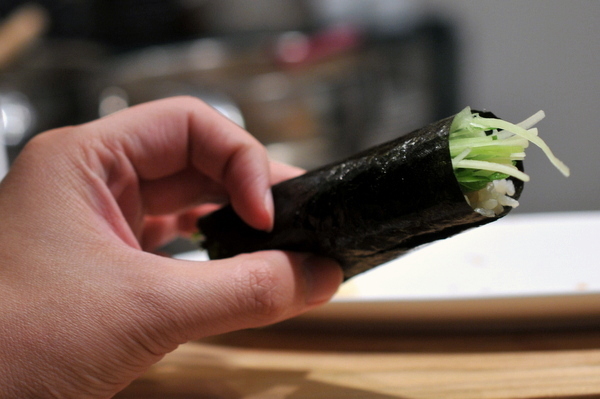 It is clear from the technique and creativity on display that Yama-san takes his craft seriously but without the forbidding demeanor of many other sushi chefs. Likewise, his business partner Stan was a warm inviting host who seems to take great pleasure in sharing Yama-san's cooking with the world. The duo were all smiles, cracking jokes with us and even waving off or apologies for our drunken behavior towards the end of the night. The result is an incomparable meal; an elegant yet comfortable affair where the food demands respect without feeling overly stuffy. At the end of the meal one of my friends decided to cover the meal for our entire party. Thanks Mike! I had high expectations for Yamakase and the meal was everything I had hoped for and more. Yama-san may play a little fast and loose by the standards of traditional Japanese cooking but the results are nothing short of brilliant. Hands down the best overall sushi experience of 2012; looks like Urasawa is going to have some stiff competition in 2013. I honestly had mixed feelings about writing this post; on the one hand, talent of this level deserves to be celebrated, but on the other hand, each person who reads this makes my next reservation that much harder to secure. So how many people were in your party? Trying to gauge the price point here! We had 7 people it was 230pp for food only. Likewise, his business partner Stan was a warm inviting host who seems to take great pleasure in sharing Yama-san's cooking with the world." Great eating with you too. We can do it again at The Royce. The first statement refers to the fact that restaurant isn't widely known like Urasawa, Zo or Mori though the food is of comparable quality. When I say Stan takes pleasure in sharing Yama-san's cooking I don't mean he does a lot of advertising. While we were there he was covering for the regular server and he seemed genuinely happy to see us enjoying ourselves. Stan is a cool guy! definitely made the experience even more enjoyable. soooo when are you bringing me? Agreed. Glad they weren't too mad at my drunken antics. My friends want to go back soon... when you gonna be up here?